Inspired by Inside Atlanta, a series created by Atlanta Expert, Kate Parham Kordsmeier, we'd like to introduce Inside Houston. Each month, we'll be interviewing prominent Houstonians on their favorite things to eat, see and do in the Bayou City. Previously, we spoke with Vanessa O'Donnell, owner of Ooh La La Dessert Boutique and Houston Moms Blog's Kelly Davis. 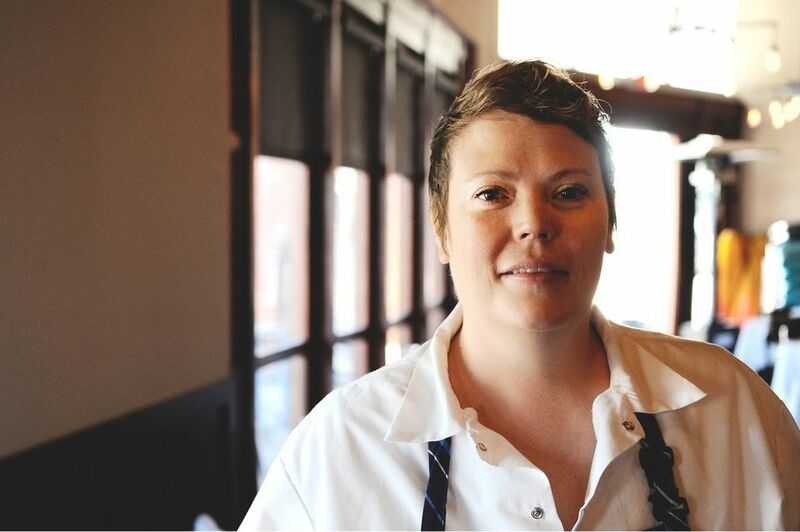 This month, we're sitting down with Chef Brandi Key. As Clark Cooper Concepts Culinary Director she influences the menus of some of Houston's best restaurants, including Ibiza Food & Wine and Brasserie 19. She's also the Executive Chef for Coppa Osteria, Punk’s Simple Southern Food, SaltAir Seafood Kitchen and The Dunlavy, where she oversees the development and management of the kitchens, menus and teams in each of the spaces. Throughout her her career, Key has spent time in both large and small kitchens, with each one shaping the chef she is today. Prior to her current role in Houston, she 's worked for over a decade with organizations like Pappas Restaurants and Tante Marie Cooking School, as well as the legendary chef Cindy Pawlcyn, to hone her skills as a chef and restaurateur. Her work has earned her significant badges of honor in the Houston foodie community, including the 2013 Houston Culinary Awards Chef of the Year and Houston Modern Luxury’s 5 Women to Know in Houston. I live in ... "the Heights area in Houston. I love the area because of the neighborhood feel and sense of community it provides. It’s been so much fun watching this community change and grow over the past few years with all of the talented chefs, bartenders and business owners making the area their home." I wish people knew ... "that not every day is 100 degrees with 100 percent humidity. We have great fall and winter months that are a blessing to everyone who lives here." You can find me ... "on a typical day, I will make it to at least two, if not three, of the restaurants. Each morning, I read through our recaps from the day before, look over my calendar and lists, and make a game plan for that day. I put myself in the restaurants with the most priority at the time, depending on special events, changes to the staff and menus, or if I have some inspiration for the food there. I am constantly thinking about and talking about our food with my chefs, even if I don't necessarily make it into their restaurant on a given day." It's dinner time. I'm headed to ... "Lupe Tortilla. I love their beef fajitas, and their customer service is some of the best in the city. " Houston’s best-kept secret is ... "R Bar. It’s a friendly neighborhood bar on Memorial Drive that makes great drinks and has one of the best trivia nights in town." When I'm playing tourist, I like to go to ... "The Beer Can House. The Orange Show. Rothko Chapel. Canino’s on Airline. Himalaya. Goode Company. Saint Arnold’s Brewery." When I want to unwind, I go to ... "Mercantile in Montrose. They make my favorite cup of coffee in town." My favorite place to get fresh air in the area is ... "The lawn at The Menil Collection." My favorite weekend activities in the Houston metro area ... "I typically work most every weekend, but if I had the day off, it would definitely involve a movie at iPic Theater. I just can’t get over those chairs." I like to spend money at ... "Texas Art Supply, looking at all of the paper and pens and pencils and notebooks. I could spend hours in there. When it comes to window shopping, you can’t really beat the River Oaks District for all things designer…and shiny." The thing I love most about Houston is ... "all of the different neighborhoods that are smashed up next to each other that can be so diverse and truly make Houston the great city that it is today." My advice for travelers coming to visit the city is ... "make friends with someone here! The best way to get the lowdown on the mom-and-pop places is to talk to the people that live here. We all have our favorites, and they are all probably worth the visit!"